Lighting, infotainment, electronic systems and powertrain components. In Geneva, many carmakers previewed automobiles featuring Magneti Marelli components. Focus on the new Jeep Renegade and on the Peugeot 308, Car of the Year 2014. Plenty of emphasis on the Magneti Marelli technologies to be featured at the Geneva Motor Show. Until 16th March visitors of the Swiss event will be able to take a look at the best that automotive technology can offer on many European and world previews, with applications in the following areas: lighting, powertrain and electronic systems, suspensions, shock absorbers, plastic modules and exhaust systems. The most awaited-for previews include the Jeep Renegade, which fits technologies developed by all of Magneti Marelli’s business lines, such as the new instrument cluster that incorporates a 7” colour display with infotainment functions where all data useful to the driver, such as vehicle-related information, can be displayed. In addition to this, two analogue indicators for speed and rpm display. The Jeep Renegade also fits Magneti Marelli Automotive Lighting halogen and Xenon 25-Watt lighting systems, DRL (Daylight Running Lighting) and rear lamps. In the powertrain area, Magneti Marelli supplies intake manifolds with motorized throttle, manifold and sensors for gasoline and diesel engines along with electronic control units for the Etorq 1.6 and Fire 1.4 gasoline engines. It also supplies electronic control units and actuator kits for the dual-clutch system. Other major technologies are dedicated to suspension and shock absorber systems equipped with the FSD (Frequency Selective Damping) valve, which constantly works to adapt the response of the shock absorbers, and consequently driving comfort, to road conditions. Plastic components and exhaust systems complete the Magneti Marelli supply. European preview for the Jeep Cherokee, which fits halogen and Xenon headlamps, DRL, body computer and powertrain components. Plenty of focus on the Peugeot 308, which received the prestigious “Car of the Year 2014” award for Europe during the Swiss event. The Peugeot 308 – also presented in Geneva in the SW version – fits many important technologies developed by Magneti Marelli, such as lighting systems, infotainment, instrument clusters, shock absorbers and engine control systems. 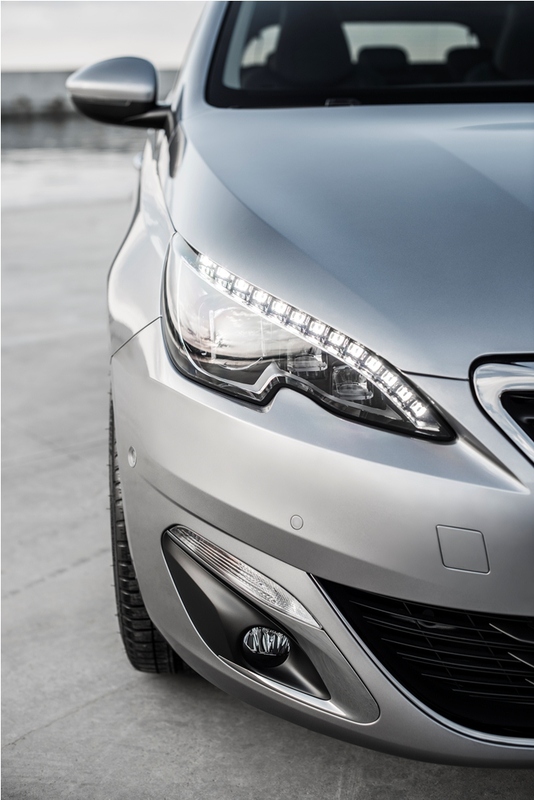 The full-LED headlamps assembled on the Peugeot 308 use LED technology for all lighting and signalling functions, for a total of 31 LEDs on each headlamp. All functions have been designed to work through a simple thermal dissipation system, for better optimization in terms of CO2 emissions resulting in a reduction of up to 50% compared to traditional halogen lights. The in-vehicle multimedia entertainment system Touchscreen is one of the main features of the Peugeot i-Cockpit mounted on the Peugeot 308. This system represents the best of Magneti Marelli’s technology in the field of integrated Infotainment, Connectivity and Navigation systems, and it is characterized by the almost total absence of pushbuttons, for simple and user-friendly ergonomics. The new Touchscreen version developed for the Peugeot 308 allows management of the air-conditioning (single-zone or automatic dual-zone) and driving assistance systems, such as the Driver Assistance Pack, Park Assist and video camera for reverse running. One car particularly appreciated by the public is the new Citroën C4 Cactus, equipped with the Magneti Marelli “Touch pad” multimedia infotainment system, which features a high-resolution 7’’ colour display. This system displays data pertaining to in-vehicle entertainment and satellite navigation, and can be used to monitor and select various vehicle management parameters thanks to connection with the vehicle CAN network. The “Touch pad” also allows access to additional telematic services. The Citroën C4 Cactus also mounts the electronic control unit and hydraulic kit for the AMT (Automatic Manual Transmission), in addition to powertrain components such as throttle bodies. Infotainment is also represented by the systems developed by Magneti Marelli and mounted on the BMW 2 Series, 3 Series and 4 Series models and on the new Mini. This is the first supply of systems resulting from the agreement signed in 2010 between BMW and Magneti Marelli. In fact, the new multimedia system originates from the technological contribution that Magneti Marelli provides to BMW, and offers a sophisticated set of features, including navigation, brilliant graphics, Internet access and connectivity, including wireless connectivity, available for the first time on entry-level systems. The most significant innovation of the Business navigation system is represented by graphic images, which are now displayed 10 times faster on the 6.5” control display. High-resolution maps, which now have 3D animations and elements, and faster itinerary calculation, characterize the progress made possible by the optimization of the control unit technology. The new infotainment system uses Magneti Marelli’s open platform to enable a wide range of in-vehicle connectivity and infotelematics applications. System characteristics include wireless connectivity, mobile office, advanced navigation and telematics. The BMW 2 Series and 4 Series models also feature, respectively, halogen and LED headlamps and Halogen and Bi-Xenon headlamps, including with the adaptive and LED system. Magneti Marelli Automotive Lighting’s technologies are also found on the new Ferrari California T, equipped with Bi-Xenon headlamps with AFS system and LED rear lamps. The Ferrari California T also features the body computer, GDI (Gasoline Direct Injection) injectors pump and electronic control unit for the DTC (Dual Clutch Transmission). The avant-premiere of the Alfa Romeo 4C Spider was also unveiled in Geneva. This car is the “uncovered” evolution of the model launched last year which received many awards. It fits new Xenon headlamps, which complete the supply of Magneti Marelli technologies already found on the coupé version, such as the LED rear lights, electronic control unit and hydraulic kit for the dual-clutch transmission, exhaust systems, modules, suspensions and shock absorbers. World premiere for the Alfa Romeo Giulietta Quadrifoglio Verde with 240 HP and a 1750-cm3 engine which, for the first time, is teamed up with the dual-clutch transmission. This version features technologies already mounted on the Giulietta range, such as body computer, headlamps and rear lights, suspensions, electronic engine control units and powertrain components, such as the control unit and hydraulic kit for the dual-clutch transmission. International premiere also for the new Fiat 500 MY 2014 – that reaches the top expression with the exclusive Cult Version - which debuts a new instrument cluster with a 7” TFT digital display developed in collaboration with Magneti Marelli, which provides all information useful to the driver, such as data supplied by the speedometer, rev counter and trip computer, all immediately visible at the same time. The central part of the display – featuring a large image of the vehicle – can be configured according to the driver’s preferences, choosing from the various information provided by the trip computer, such as travelled distance, instantaneous fuel consumption and autonomy. New components and systems for the Fiat Panda range too, now enriched with the Cross version which mounts all of the Magneti Marelli technologies available on the other models of the range, including lighting systems, electronic engine control units, powertrain components and exhaust systems, suspensions and shock absorbers. Magneti Marelli lighting systems for Mercedes-Benz as well, specifically the full-LED headlamps fitted on the S-Class Coupé and halogen and LED headlamps with adaptive system on the new C-Class. Magneti Marelli lighting technologies can also be found on the Mercedes-Benz CLA Shooting Brake, which fits halogen or bi-Xenon headlamps with AFX (Adaptive Frontlighting Extended) and LED rear lights. Magneti Marelli Automotive Lighting’s technologies are also fitted on the Audi RS4 Avant Nogaro Selection, with headlamps in both the Bi-Xenon or full-LED versions. On the new Audi TT, three versions of headlamps supplied by Magneti Marelli Automotive Lighting are available: the 25-Watt Xenon, full-LED and full-LED matrix. Magneti Marelli also supplies the instrument cluster for the Audi RS4 Avant Nogaro Selection. At Renault, the new Clio RS mounts new 25-Watt Xenon headlamps that emphasize the sporty spirit of this car. There are many other lighting applications, such as the Xenon headlamps with AFX for the Opel Zafira and the rear lamps for the Golf Sportsvan (with LEDs), Opel Astra and Zafira. This year’s edition of the Geneva Motor Show celebrates the “24 hours of Le Mans” with a special display that brings together twenty of the most beautiful and winning cars that have ever competed in this historic race. The motorsport technology of Magneti Marelli and of some of its legendary brands (Carello, Jaeger and Weber) is featured on many of the historical cars on display, including the Ferrari 166MM and Testa Rossa, the Bugatti Type 57, the Alpine Renault and the Peugeot 905.